Woodhead Heritage continues to support traditional crafts and heritage skills when more than 2,500 visitors attended the 1,000 Years of Traditional Crafts event. Held on 22 and 23 June 2013 at Lincoln Castle, the event was organised by Lincolnshire County Council and supported by Robert Woodhead Ltd. 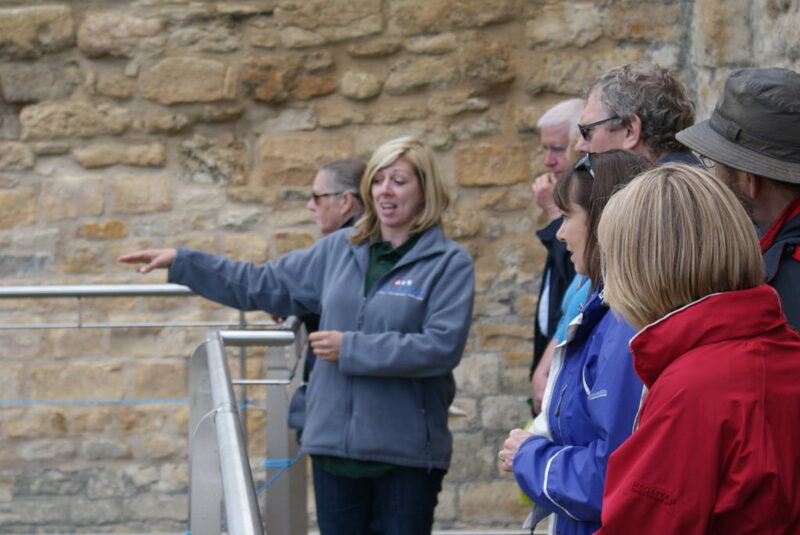 The weekend of activities provided an opportunity to promote Lincoln Castle, as well as highlight the importance of maintaining and developing heritage skills. The specialists from Woodhead Heritage were based within the Heritage Skills Centre and had organised various heritage skills demonstrations including stonemasonry and lead work, as well as displays and talks around the Heritage Skills Centre project and the on-going Castle Wall renovation and development. Video footage showing the Heritage Skills Centre work was also screened. On top of this, over 700 visitors were given guided tours of the Castle Wall by Woodhead Heritage personnel including Simon Butler, Heritage and Conservation Manager; Richard Carton, Site Manager; Heath Shakespeare, Lead Mason and Jane Harrison, Project Co-ordinator and Stone Conservator (pictured taking a tour group). Woodhead Heritage, with Robert Woodhead Ltd, will continue to support the 1,000 Years event and other Heritage events. For more information view films of the Heritage Skills Centre project as well as project information on the Lincoln Castle Walls Restoration and Conservation project.